A certain YouTube video came to my attention involving two very iconic video game titles. The footage contained the opening game play of Half-Life 2: Episode 2 with one minor tweak. 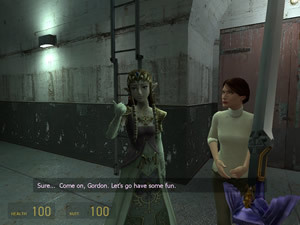 Alyx Vance, a major character in the Half-Life series, was missing and in her place was none other than Princess Zelda. This was a revolutionary change for both Half-Life and The Legend of Zelda, one that hopefully will not go unnoticed by Valve or particularly Nintendo. This spectacular discovery inspired me to seek out this mod and find out more. Half-Life 2 Modifications using the Source engine is nothing new. Since Half-Life 2 launched in 2004, people have modified the game to build their own creations and post them online. This community of programmers was unknown to me until just recently when freelance programmer FluxMage posted his recent work on the Facepunch Studios forum. He directed the forum to garrysmod.org to download this latest mod. The first was for Half-Life 2 which also works with Half-Life 2: Episode 1. However, in order to play Half-Life 2: Episode 2, it required a different mod. Both files download a zip file that must be extracted before use. Once extracted, both mods come with an easy to follow Readme file that explains exactly what to do. Following the instructions was actually very easy, but for such drastic changes, it was concerning that perhaps it was too easy. Take note that there is another modification available to replace certain NPC soldiers with Zelda, but my decision was not to test this mod at this time. After maybe a half hour of searching and setting adjustments, Half-Life 2: Episode 2 started up and successfully displayed Zelda as Alyx, to my relief. After this confirmation, my decision was to leave the game and start playing Half-Life 2 from the beginning in order to get the full experience. Now before getting too far ahead, there was one other mod found in the same forum thread at Facepunch Studios. After what appeared to be a few sarcastic comments from forum members about adding the Master Sword to the game, member Bill Ding posted an already existing mod replacing Gordon Freeman’s crowbar with the one and only Master Sword. This file works for all three Half-Life 2 games, and is installed similarly to the Princess Zelda mod. has to put into this kind of project must be quite a task. couldn’t have done a better job if they made Half-Life themselves. have done in her place. Wait, what was that? Zelda with voice work? Nintendo couldn’t have done the same thing. flaws are not that noticeable, but they are there if you are nitpicking. grown up in a time of war, where dresses were not quite as in style. sometimes bleed through her dress out the back with every few steps. than other problems. Also, Zelda isn’t very good at sitting down. big dress doesn’t quite fit into the car all the way. couch next to her father, but these still aren’t that big of a deal. Combine army with Zelda in shotgun holding a shotgun. Try to show a little enthusiasm for such an unlikely scenario. gets a message from Alyx over an old radio/television screen. segment was supposed to interpret a poor signal with a lot of static. good considering how much face time Zelda gets instead. a great mod, but it nicely compliments the Princess Zelda mod. even play Half-Life with a console controller. Believe me. justification for going back to text boxes. their speech. Why did Nintendo neglect to read those text boxes? significant step forward for the Metroid series. voiced environment. So why is Zelda still so far behind in comparison? a remarkable Half-Life 2 mod. before seen by Half-Life or the Legend of Zelda franchise.